Box Text: Rally the troops! Just when you thought you'd seen the last of them, the Black Hole Army is storming back in this sequel to this award winning Game Boy Advance strategy game. With new COs under his command, Sturm is leading a new invasion force, and it'll take advance strategy to stop him! *New COs and CO Powers! Fight against a host of Black Hole Army COs, and use new Super CO Powers, like Typhoon and Max Blast, to rain destruction upon your enemy. *New units and terrain features! Command the massive neotank and take control of missile silos to launch davastating attacks from afar. Use the new features in the map designer to create even more challenging maps. *Battle your friends! Single- and Multi-Pak multiplayer (Multi-Pak games require one Game Pak per player) modes bring you head-to-head against your friends. Create your own battle maps, then trade with your friends or challenge them to a war of advance proportions! 05-24-2016 Box Text Rally the troops! 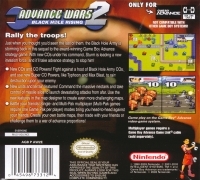 Just when you thought you'd seen the last of them, the Black Hole Army is storming back in this sequel to this award winning Game Boy Advance strategy game. With new COs under his command, Sturm is leading a new invasion force, and it'll take advance strategy to stop him! *New COs and CO Powers! Fight against a host of Black Hole Army COs, and use new Super CO Powers, like Typhoon and Max Blast, to rain destruction upon your enemy. *New units and terrain features! Command the massive neotank and take control of missile silos to launch davastating attacks from afar. Use the new features in the map designer to create even more challenging maps. *Battle your friends! Single- and Multi-Pak multiplayer (Multi-Pak games require one Game Pak per player) modes bring you head-to-head against your friends. Create your own battle maps, then trade with your friends or challenge them to a war of advance proportions! 04-16-2014 instantreplay Box Text Rally the troops! 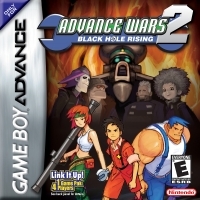 Just when you thought you'd seen the last of them, the Black Hole Army is storming back in this sequel to this award winning Game Boy Advance strategy game. With new COs under his command, Sturm is leading a new invasion force, and it'll take advance strategy to stop him! This is a list of VGCollect users who have Advance Wars 2: Black Hole Rising in their Collection. This is a list of VGCollect users who have Advance Wars 2: Black Hole Rising in their Sell List. This is a list of VGCollect users who have Advance Wars 2: Black Hole Rising in their Wish List.